(1) button : Mode changes each time the button pressed. (2) VOLUME button : Raises or lowers speaker volume. - Briefly press the key: Move to next or previous preset channel. - Press and hold the key: Automatically searches for broadcast frequencies. - Briefly press the key: Move to next or previous song. - Press and hold the key: Rewinds or fast-forwards the current song. (4) button : Activates voice recognition. (5) button : Places and transfers calls. (6) button : Ends calls or cancels functions. 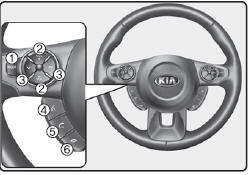 ➀ Briefly press (under 0.8 seconds) the key on the steering remote controller. ➁ The call history list will be displayed on the screen. ➂ Press the key again to connect a call to the selected number. ➀ Press and hold (over 0.8 seconds) the key on the steering remote controller. ➁ The most recently called number is redialed.